I've not been using hand cream for very long and I've only tried a couple of different ones but what I have discovered is that I'm apparently very picky. Two that I've tried recently I've given away to my mum because I didn't like the smell of one and the other one left my hands feeling too oily. 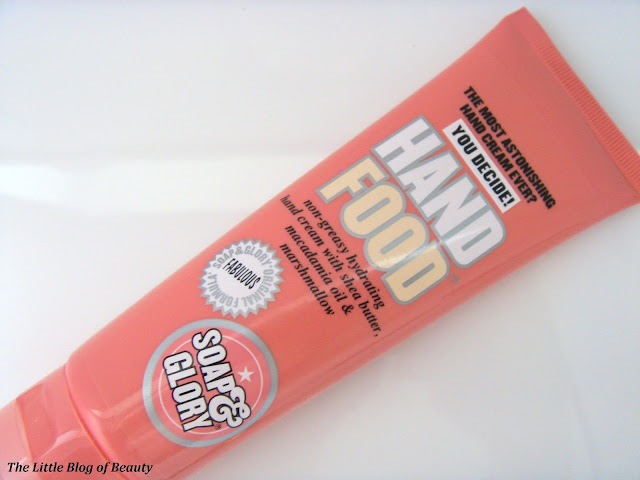 I got a sample of Soap & Glory's Hand Food in the goody bag I received from the Harvey Nichols Bristol blogger event earlier this year. I started this recently and I really like it so I decided to head down to Boots to pick up a full size version. 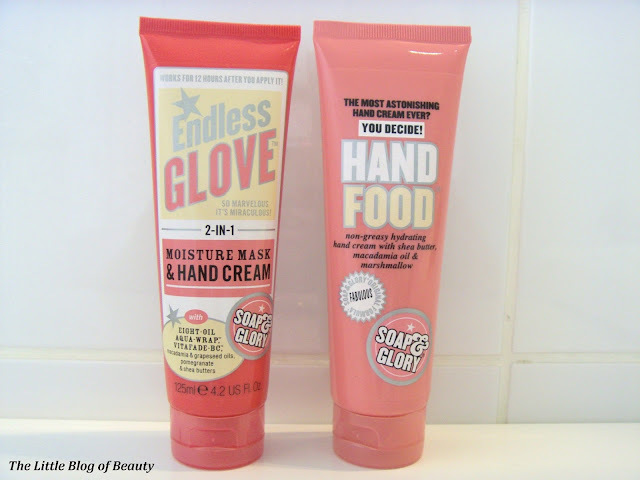 As Boots had a 3 for 2 offer on Soap & Glory I also got Endless Glove (which I'd not heard of before) and Heel Genius (which I will blog about in the future). Hand food contains shea butter, macadamia oil and marshmallow (how amazing does marshmallow in a hand cream sound!). My requirements for a hand cream are that it has a nice light scent, absorbs quickly and doesn't leave your hands oily or greasy for ages afterwards and Hand Food delivers on all on these. This absorbs within seconds and leaves nothing behind except nice soft skin. 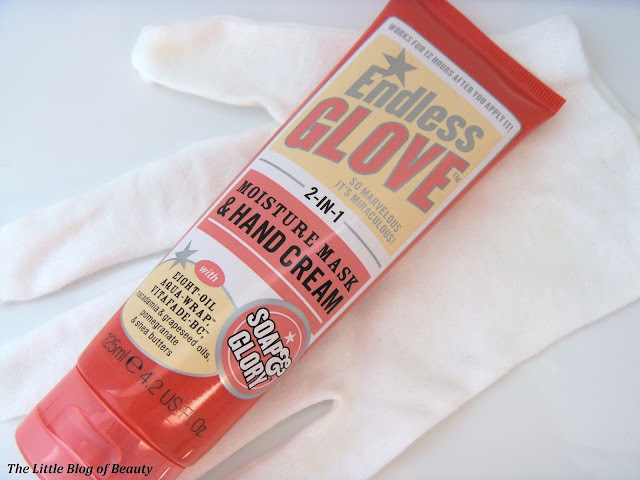 Endless Glove is a more intensive hand cream which can be used as just as a hand cream or as a moisture mask. This contains what Soap & Glory have called Eight-Oil Aqua Wrap (which I assume means this contains eight different oils) for maximum moisturisation. In terms of using this as just as a hand cream this doesn't absorb quite as quickly as Hand Food but this is to be expected as it's a more intense moisturiser. To use this as a moisture mask what you really need are a little pair of cotton gloves. Top tip - if you're going to grab some gloves to use with this don't get them from the display with things like exfoliating gloves, flannel headbands etc as you'll pay at least £4. 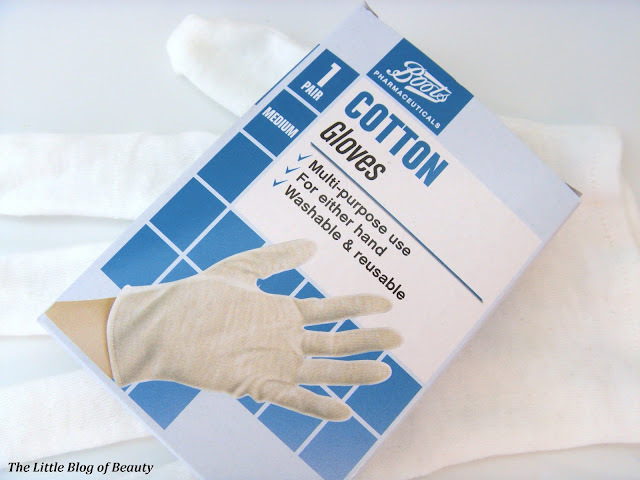 Head over to where the plasters, bandages and wrist supports are and you'll find a perfectly good pair of cotton gloves for just £2.59. The packaging may not be as pretty but they're the same thing and the money you've saved can go towards that new lipstick you've got your eye on! You just apply a generous amount of Endless Glove, pop your little cotton gloves on and go to bed. I thought I wouldn't be keen on wearing gloves to bed but I actually found it quite comforting. This has a reasonably strong scent but I don't mind this at all as it smells so lovely. I could smell the scent coming from my gloves as I was falling asleep and it was really quite soothing. Then in the morning you take your gloves off to reveal lovely soft hands. I love the quirky, bright packaging that Soap & Glory use for all of their products, although sometimes this can look a little too 'busy' in places. I also like that you get a lot of product for your money but also that several of their products have a mini travel size available for just a few pound. I love both of these hand creams and if you saw my wish list I posted recently you'll know that I'm now lusting after several of Soap & Glory's other products (some of which I have already bought, oops!). I am a nightmare when it comes to hand cream, I hate the greasy feel! Good idea with the gloves, my friend does this and has the softest hands!